What is the National Rehabilitation Hospital? The National Rehabilitation Hospital (NRH) provides comprehensive inpatient and outpatient services to patients who have acquired a physical or cognitive disability as a result of an accident, illness or Injury and require specialist medical rehabilitation. Our aim is to return you to the highest level of independence possible & maximise the quality of your life. What makes the National Rehabilitation Hospital different from other hospitals? What makes the NRH different from an ‘acute or regular hospital’? A regular hospital treats a one-time illness or injury, usually on a short-term basis. Their main focus is to meet medical needs and to quickly return patients. The National Rehabilitation Hospital provides therapeutic and medical rehabilitation services and education dedicated to returning patients to the highest level of independence possible and aims to maximise the quality of their lives. How long before I can get in? Often this can be a difficult question to answer. Your admission depends on a number of factors including your diagnosis, your readiness to undertake rehabilitation and the availability of an appropriate bed in the service you require. At times there can be significant waiting lists. How long will I stay there? This too can be a difficult question to answer. A Consultant or Liaison Nurse from the NRH may be able to give a broad indication of your length of stay. However on admission to the NRH you and your team will participate in the assessment process and we will endeavour to answer this question as accurately as possible. Usually you will be given a discharge date not later than two weeks after your admission. 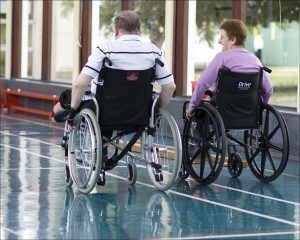 The goal of rehabilitation at the NRH is to make you as independent as possible. It may be that life into the future is different for you and your family but the expertise of the staff in the NRH will assist you and your family in adjusting to that changed future. Staff at the NRH will take every opportunity to maximise all possibilities to achieve health and social gain through effective treatment and education. What will I do in the NRH? The day in the NRH is usually structured between spending some time on the ward and attending therapies. Therapy is usually scheduled on weekdays. Ward routines can begin early and therapies usually finish before 5.00pm. What facilities are in the NRH? The NRH has treatment gyms and areas where you can practice activities of daily living, a hydrotherapy pool, sports hall, patient recreation areas and library, wireless internet facilities, a coffee shop and a patient canteen. Our Therapeutic Recreation Service and Volunteers come into the hospital, primarily in the evenings to arrange activities for patients on an ongoing basis. Is there an NRH Private? No, the NRH is a fully publicly funded, voluntary hospital and operates on the ethos of providing high quality care and treatment to patients irrespective of background or status, but on the basis of clinical need.